FI Mentoring | XplorAction, Inc.
Like many training students who have participated in our mentoring supervision you can enhance your learning process. It helps you keep your momentum, which can often get lost between segments. The next segment doesn’t feel like a “cold start”. It gives you more confidence and competence in starting up ATM classes. It helps you integrate the method in your lives. This mentoring is a tailor made advanced training open to recent grads as well as experienced practitioners. Deepen your understanding of fundamental lessons or learn something entirely new and unfamiliar! Note: applies to Continuing Education requirements for FGNA certification renewal. Angel or Richard gives one practitioner a lesson while the other observes. The thinking behind the FI process is discussed before, during and/or after the lesson. The practitioner who received the FI gives the lesson to their colleague while being mentored. Bring a friend or a client, give them a supervised lesson and receive feedback. Bring a guest. Angel or Richard gives them a lesson while you observe. We discuss the FI afterwards (guests either have the option to remain for the discussion or leave). Give Angel or Richard an FI. We will offer feedback during and/or after the session. If you are a practitioner, bring a client for whom additional input would be welcomed. Angel or Richard would interview and give them an FI while you observe. We then discuss the lesson afterwards. Of course, other formats can be created to meet your individual needs. We also offer supervision to groups of trainees or practitioners. For those who come from out of town, Angel and Richard suggest weekend workshop intensives. If you need a place to stay, there are many reasonable hotels nearby. How Long Is A Mentoring Session? Each session last an hour and a half to two hours (depending on how many people attend). We also offer weekend intensives. TO SUPPORT OUR COMMUNITY WE ARE OFFERING AFFORDABLE HOURLY RATES. DISCOUNTS WILL BE PROVIDED TO TRAINEES. 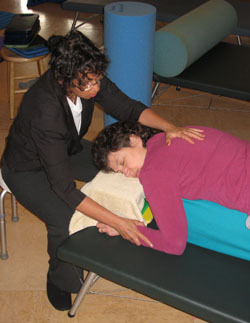 Doing a FELDENKRAIS training yielded innumerable, positive changes in my life, but I never found a clear path to go forward as a practitioner until I met Angel. Angel immediately honed in on my strengths and knew how to help me further develop them. Our mentoring sessions are packed with content, warmth and humor. Thanks to Angel’s insightful and gentle encouragement, her deep understanding of the work, and her “above and beyond” support, I’m finding the knowledge and confidence I needed to pursue a professional practice. “I have recieved a few mentoring sessions with Angel and Richard and it’s really helped me to continue my education and grow as a practitioner. While Angel and Richard’s technique is quite different from one another, I think this actually makes the experience more enriching. I get different ideas, lines of thought process, and knowledge from each of them. I get one-on-one coaching and more fine-tuned distinctions that can be harder to get in a big classroom type environment. I also learn things to practice with my other ‘clients’ I work with. It kind of helps keep me on track and from getting out of touch with the work. I recently took my husband to Angel for a mentoring session. (A spouse or close friend is nice because you can talk more openly with the “client” there.) He enjoys the experience because he gets to help me and benefits from my learning by getting an FI lesson to boot. It’s been a good way to include him in the process. I really appreciate what the sessions have done for me and my clients. I have been receiving weekly 1 hour FI mentorship from Angel. It blows me away realizing that a weekly mentorship has made such a difference in my understanding of this work. The difference between giving a good, great and excellent FI is very obvious. The underlying subtleties of giving a clear FI where the clients can really tune in is so simple yet easy to miss. I have to say I am more confident and clear in my FI’s with my clients and they also noticed it. I’ve learned to really slow down and listen to their needs. And now, they’re all excited and looking forward to the next FI session. I would highly recommend all of you to get some ongoing mentorship from Angel and Richard. It’s truly worth it and for me has sustained the investment I made in my training.